Horoscope of a Yogi – Paramhansa Yogananda. So after a very long time, a Celebrity Horoscope. Horoscope of a Yogi - Sri Paramhansa Yogananda. In case, people don’t know about him then please read his book Autobiography of a Yogi, which is among the best selling books of all times. He was one of the most influential Spiritual Gurus from India in 1st half of 20th Century after Swami Vivekananda & Swami Ramtirth and alongside Swami Raman Maharishi & Maharishi Mahesh Yogi. He spread the practice of Kriya Yoga in India and to West through his Organization Yogoda Satsang Society. Somehow, I feel that the best feature of his book Autobiography of a Yogi is that it is “Hilarious”. It is hard to believe that he conveyed his spiritual message as a Yogi through funny one-liners and jokes. People may check his wiki page here - https://en.wikipedia.org/wiki/Paramahansa_Yogananda for more information on him. Now, let’s analyse his chart the way I analyse my clients’ charts to know the right Life Path/Career or Destiny. 1. Ascendant – As we can see, he was born Leo Ascendant with Ascendant Lord in 5th house in Sagittarius with Mercury. As Ascendant Lord position shows us the direction of life path, as Sagittarius is sign of Higher Learning/Religion/Preaching/Teaching/Guru etc and as 5th house relates to Education, it shows that his life path would go in the field of Higher Learning, Religious Preaching etc. As Sun represents Career, it pretty much became his Career and as Sun also represents Authority, it shows that his Authority came from the field of Higher Education. Mercury’s conjunction with Sun is very important here. 1st of all, Mercury is Communication & Speech, and sitting with Ascendant Lord Sun, it clearly links Preaching/Counselling with his Life Path and Career. 2nd thing is that Mercury rules his 2nd house of Wealth and 11th house of Earning. So, it assured that by following the life path of Preacher, he will be able to earn Money also for living a good life. Another important thing with his Ascendant is Moon placed in Ascendant. As Moon represents Mother, it shows that his relation with his Mother was most important in making him follow his life path. A careful reading of Autobiography of a Yogi will let us know the emotional bond between him & his mother and how a letter of Mother received after her death made him to go on Spiritual Path. In the book, he continuously addressed God as Divine Mother, which also gives an indication towards prominence of Moon in his chart. 2. Ascendant Nakshatra – Now, the life pattern. Most of the things indicated by Ascendant Lord were related to Religious Preaching, but he was considered as Spiritual Guru. We can see this from Ascendant Nakshatra Magha. Magha’s lord is Ketu. Ketu represents Spirituality, Occult & Mysticism and it sits in 3rd house of Communication, Teaching and Speech. So, it shows that his life pattern remained in the field of Spiritual Communications and Teaching. As Ketu also represents Meditation, this explains his Teaching as Kriya Yoga Guru too. 3. 10th house – 10th house of Horoscope is always the most important for Career. It shows the Work Environment person should be, which is very much indicator of the Career we should be in. His 10th house has Taurus sign there and Taurus lord Venus is in Scorpio in 4th house. Scorpio’s lord Mars is in 8th house of Occult, Mysticism with Jupiter and another Lord Ketu is in 3rd house. 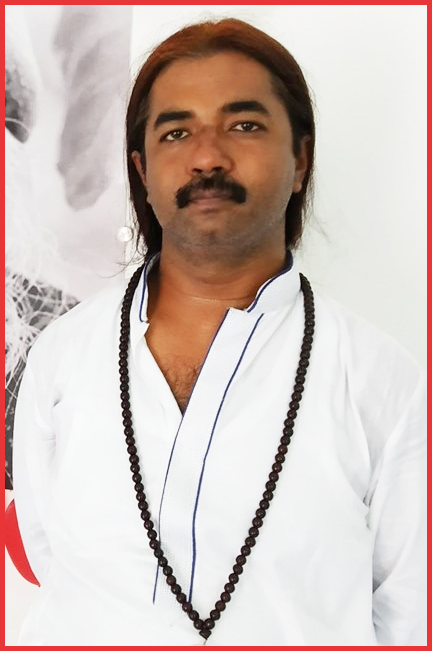 As Scorpio, Ketu and 8th house represent almost the same thing, it shows his work environment should be related to Occult, Mysticism, Meditation and Preaching. An important component with this position is Jupiter in 8th house in Pisces. Not only Jupiter is in own sign and it is sitting with Mars which rules his 10th house lord, but Jupiter also rules his Ascendant Lord Sun and Mercury in 5th house through its sign Sagittarius. So, Jupiter becomes a kind of most important planet for him as it rules 5th and 8th houses, sits in own sign in 8th house, rules over his Ascendant Lord and Wealth Lord, conjuncts Mars which is lord of 10th house lord Venus and also aspects back at Venus in 4th house. Now, What is Jupiter? It is Guru. After his mother, if anyone had most impact on Paramhansa Yogananda, it was his Guru Sri Yukteshwar Giri. Again, Jupiter in 8th house and in sign of Pisces. 8th house is Occult & Mysticism and Pisces is sign of Spirituality. So, Yukteshwar Giri was commonly known as a Spiritual Master as he was Guru of Paramhansa Yogananda but in North India, his real name & fame was as an Astrologer. Also, Mars with Jupiter suggests that his Guru was very strict and yes, Yukteshwar Giri was a very strict teacher, about which we can again know by the book Autobiography of a Yogi. Actually, a Sadguru will always be strict as his only job is to thrash the ego of disciple. 4. Rahu in 9th house – As Rahu represents our past-life desires, its position in chart almost seals the case as to the destiny of person in this life. He has Rahu in 9th house of Religion/Philosophy/Higher Learning in the sign of Aries. It clearly shows his obsession towards Religion and Higher Learning. As 9th house relates to different religions, this shows his extreme interest, study and work in Christianity. As 9th house also represents Gurus, through Yukteshwar Giri, he came to know about the true meaning and interpretation of Bible and what Jesus wanted to convey? All his later preachings, writing and books had analytical studies of Bhagwad Geeta & Bible. Aries is also the sign of our individuality and uniqueness. Having Aries in 9th house shows that he asserted his individuality & uniqueness through Religious Studies & Preaching. 5. 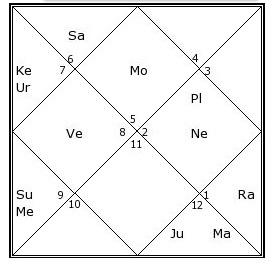 Bhrigu Bindu (BB) – His BB falls into 11th house where Gemini sign is placed. Gemini is basic sign of Communications and its lord Mercury is with Sun in Sagittarius. We have already discussed in detail that it leads him to follow Career/Life Path in Higher Learning, Religion, Preaching and Teaching. Sun, Mercury, Mars, Saturn & Ketu aspect his 11th house, which all in his chart, one way or the other represents Higher Learning, Occult, Mysticism and Meditation. I can go on adding more and more points to further analyse his career but it is clear from this analysis that what made him to follow Spiritual Path in life. Hope this is clear and understandable. 7th house is the main house of Marriage & Spouse. 7th house lord Saturn is in Virgo in 2nd house. Now, 2nd house is 8 houses away from 7th house. 8th house is house of Death. Hence, Saturn going 8 houses away from 7th house of Marriage and Spouse shows the death of benefits of Marriage. If Saturn had been conjunct any benefic planet like Mercury or Jupiter then things would have been different. But here it was a case of death of marriage benefits. Venus is main karaka of Relationship. Venus is in 4th house. 3rd house has Ketu and 5th house has Sun. Hence, it is creating a Paap Kartari yoga involving 4th house and Venus in between. It reduces the results of Relationships to minimum. Although, Mercury is with Sun but Mercury being a neutral planet is not going to make much change in this yoga. Jupiter is another karaka of Marriage. Now, Jupiter is with Mars in 8th house and Rahu is at 9th house. Mars is at 13 degrees, Jupiter is at 23 degrees in 8th house and Rahu is at 11 degrees in 9th house. So, if we just remove the line which separates the houses # 8 and 9, it means Jupiter is sitting in between Mars and Rahu (two malefic planets) which are less than 30 degrees from each other. Again, Jupiter is crushed here between 2 strong malefic planets. This is another way of looking at Paap Kartari Yoga which is not apparent like the earlier one but a minute one. It shows that even if he had got married (as he claimed in his book that he came close to getting married thrice in his life due to conspiracy of family members), that relation won’t have lasted very long or it would have been full of up/downs. Hope this helps in understanding chart of a great Spiritual Teacher of last century.